The Debate: The 39th Game, revisited. It's been five years since the Premier League proposed a blueprint to develop and promote the league's brand overseas. This idea involved creating an additional round of competitive fixtures specifically to be played overseas, allowing the league's teams and players to showcase their talent in cities around the globe. "Game 39" was the name given to this international round. Predictably, the news was met with controversy. Fans were dismayed at the prospect of their team playing competitively thousands of miles away, where local supporters wouldn't be able to attend, lest they have the money and time to travel halfway across the globe for the privilege. Setting a precedent was another issue - what else would the Premier League be prepared to do to please the global market once the initial move of playing competitively overseas was a done deal? Other criticisms included the logistics, the strain it would put on player and staff, and the fairness of the fixtures - if a relegation-troubled team who would have otherwise survived come the end of the conventional 38 rounds was forced to play Manchester United or Chelsea a third time in the season, while their rivals had easier fixtures. It wasn't long before the proposal was discontinued. It wasn't just local supporters who voiced their concerns; officials from overseas opposed the blueprints too - Frank Lowy, chairman of Football Federation Australia, said: "FFA rejects the notion of another country playing a round of their domestic competition in Australia and intruding on the development of the Hyundai A-League and the game in Australia". Japanese FA vice-president Jungi Ogara echoed those sentiments: "We are, in principle, opposed to having Premier League games in Japan as we have to protect our league and clubs. The Premier League is by no means the first sports organisation with a view to promote itself and its assets by hosting fixtures overseas; the National Football League, also known as the NFL, is a prime example of an entity which has not only followed through with this proposal, but has also been very successful in doing so. The NFL points to several statistics highlighting American Football's success in the UK - a 154% rise in viewing figures since 2006, a 4.3m combined TV and radio audience for last year's Super Bowl, a 32% increase in its "avid fanbase" of two million UK supporters, alongside the fact five live games are now shown on British TV screens a week – three on Sky, and one each on the BBC and Channel 4. 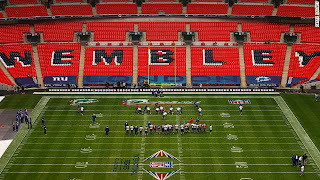 In addition, 2013 will mark the first year two NFL fixtures are played overseas in a single season, as Wembley is to host games on the 29th of September and 27th of October. There are, however, differences between the two sports' setups and global popularity. Unlike the Premier League, which is one of many competing top-level football leagues worldwide, the NFL has a virtual monopoly on top-level American Football. You're not going to find the president of the Japan American Football Association or Gridiron Australia turning down the prospect of NFL games being hosted in their cities because of a conflict of interest or scheduling. A more appropriate example to compare to the 39th Game would be that of the Supercoppa Italiana, pitting the winner of the league - Serie A - against the winner of the domestic cup - the Coppa Italia - in a competitive fixture which serves as the domestic season opener. This fixture has been played overseas several times, the first being in 1993, as Washington DC hosted Milan v Torino, as a way to market the league in the USA and draw fans to Calcio Italiano before the World Cup the following summer. Nine years passed before the Supercoppa was hosted in Muammar Gaddafi's Libya, as Juventus and Parma battled it out in Tripoli's June 11 stadium - the arrangement no doubt an embarassment to the Italian football federation in light of what happened earlier this decade, but at the time a concession made as Al Saadi Gaddafi, the dictator's son, was trying to foster relationships with Italian football. The following year, East Rutherford, New Jersey - home to many Italian-Americans - saw Milan and Juve compete for the cup, but afterwards, the fixture returned home, as the winner of the previous season's Scudetto saw their ground automatically allocated the game. 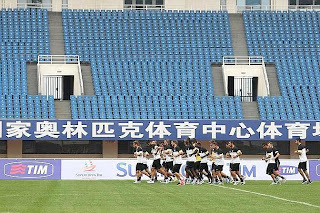 That is, until 2009, when, a year after the Olympics, a deal was agreed between the Italian football federation and Chinese sporting bodies to play the Supercoppa Italiana at the Beijing National Stadium. 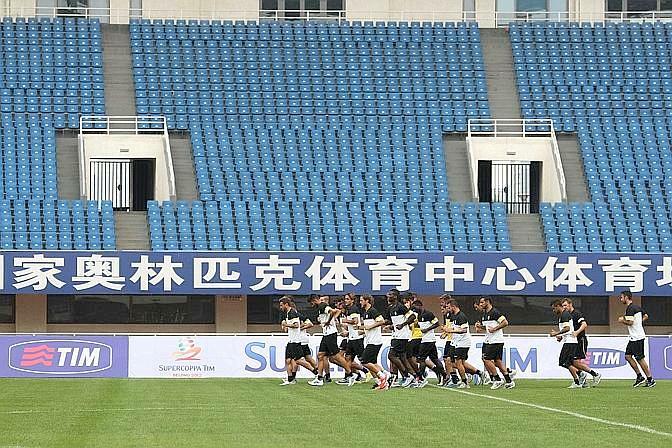 According to Italian news agency ANSA, Maurizio Beretta, president of the Italian football league, confirmed the arrangement involved playing three out of every five Supercoppe in China, with the 2012 fixture purpoted to have made Juventus and Napoli 1.7 million euros each. 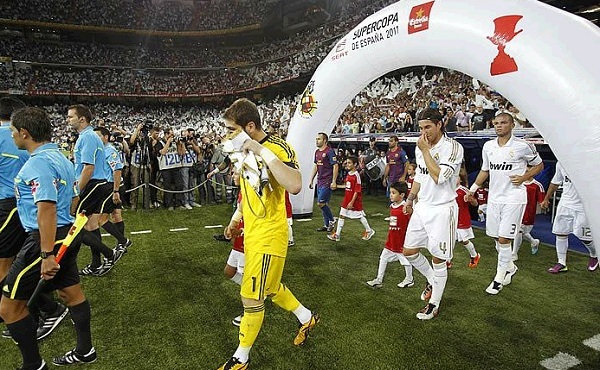 The enterprise involved in bringing the fixture to China, United Vansen International, also agreed a preliminary deal with the Spanish Football Federation in 2012 to bring the Spanish Super Cup to the Bird's Nest stadium. Spanish media reported that the deal, which has a seven-year duration, would net the RFEF around 40 million euros (32.10 million pounds). So out of arguably the three biggest football leagues in Europe, two of these - Italy and Spain - have either experience of playing their Supercup fixtures overseas, or have signed up to do so. Which leaves England. The English equivalent of the Supercup, the Community Shield, doesn't have the same prestige as other domestic trophies - several leading figures of the game have dismissed its importance, Mark Lawrenson calling it a "glorified friendly" and Sir Alex Ferguson labelling it a "barometer for fitness". Now, as friendlies are often played abroad without any issues, if any fixture were to be exported overseas, surely one which is officially a domestic cup final but has the prestige of a friendly surely would be the best candidate? Other cases for exporting the Community Shield include the fact it's at the start of the season, meaning the players would be quite fresh and that it wouldn't require a drastic change of calendar, that it's between the two most successful teams of the previous season, and that it ends with a trophy being presented to the winning team, meaning the fans abroad don't just get to watch two English teams, but also that one of them will be celebrating and lifting official silverware in front of their very eyes. Traditionally, the Community Shield has kicked off at 15:00 GMT, although different kick-off times have been scheduled before, such as in 2012 when the game began at 13:30 to avoid potential scheduling conflicts with the London Olympics. Beijing is eight hours ahead of the UK, but this shouldn't be too much of an issue as the match could kick off at 22:00 local time, meaning we'd begin to watch it at 14:00 GMT. This idea would still bring up issues and criticisms, however. The Community Shield is a popular fixture among fans, which gives them a chance to see their team in action after those dull off-season months. Since moving back to Wembley in 2007, four of the five fixtures played there witnessed crowds of over 80,000 per game, so it's unlikely that all those fans, plus the hundreds of thousands watching on television, will want to see it offshored. This is a view shared by the clubs' players and management over in Spain and Italy, where the move has already happened - Real Madrid and Barcelona have already said they wouldn't travel to China for the fixture, despite the RFEF having already signed the deal, while last year, Napoli's president initially refused to allow his team to go, before the football authorities convinced him otherwise. Possibly the biggest issue, which is related to the bottom line of this whole exercise, namely money, has to do with the fact the new Wembley Stadium cost a staggering £800m to build, and the FA is desperate to see the venue used as often as possible and recoup the costs of building it, which just so happens to be the same reason Beijing wants its Bird's Nest stadium to stage lucrative events like the Italian and Spanish Supercups. 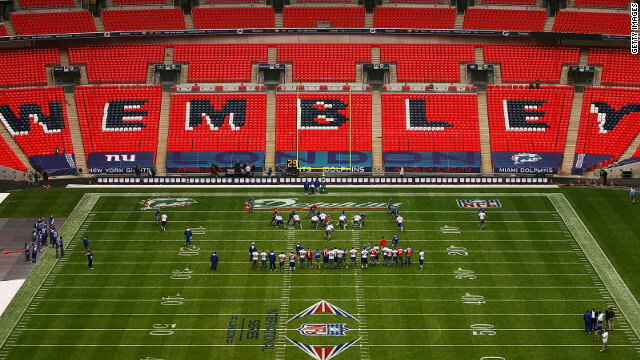 By this logic, the FA would be foolish to ship this event overseas and deprive Wembley of a high-income payday. So as a result, although Italy and Spain have already committed to playing their Supercups abroad, it remains to see whether England will follow suit. One thing is certain, though: the line of exporting competitive games has already been breached, and, to the bemusement of the Premier League and FA, they weren't first in, and are in fact now lagging behind, but with the one pioneered fixture being off-limits because of the need to service Wembley's debt, the English football authorities will need to go back to the drawing board to find ways to tap into the global market.